#22 Alabama @ #1 Vanderbilt – Vanderbilt takes game two and the series 7-0. #3 Virginia @ #11 Georgia Tech – Virginia’s 12-9 win secures the series win by handing Georgia Tech LHP Jed Bradley his first loss of the year. #5 Arizona State @ #18 Oregon State – The Beavers will be among the biggest climbers in the top 25 thanks to their taking of game two 7-6, securing the series win. #12 North Carolina @ #7 Florida State – North Carolina evened up the series with an 8-5 win. Trevor Bauer – RHP – UCLA – Jr. 9IP 6H 3ER 15K. (W, 6-1). Up to 97 K’s through 64.2IP. Austin Wood – RHP – USC – Jr. 8IP 7H 0ER 2BB 8K. (W, 2-5). Signature win for the struggling Wood thus far against Stanford. 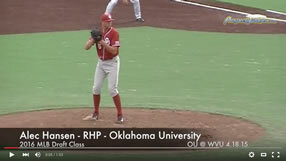 Josh Osich – LHP – Oregon State – Jr. 4IP 4H 4ER 3BB 2K. Wasn’t sharp but OSU takes the game and series against #5 Arizona State. Madison Boer – RHP – Oregon – Jr. 9IP 4H 0ER 2BB 9K. Duckswould eventually lose this game to Washington in 10. Kevin Ziomek – LHP – Vanderbilt – Fr. 1IP 2H 0ER 0BB 3K. Forrest Koumas – RHP – South Carolina – Fr. 7.1IP 3H 1ER 2BB 7K. (W, 4-0). Kevin Gausman – RHP – LSU – Fr. 8IP 5H 0ER 1BB 5K. Michael Wacha – RHP – Texas A&M – So. 6.2IP 4H 2ER 3BB 5K. Burch Smith – RHP – Oklahoma – Jr. 7IP 6H 2ER 3BB 6K. Jed Bradley – LHP – Georgia Tech – Jr. 4.2IP 8H 7ER 2BB 5K. (L, 3-1). #3 Virginia hands Bradley his first loss of the year. Tyler Wilson – RHP – Virginia – Sr. 4.1IP 5H 5ER 4BB 1K. Kent Emanuel – LHP – North Carolina – Fr. 3.1IP 10H 4ER 0BB 2K. Matt Purke – LHP – TCU – So. 85.2IP 3H 2ER 2BB 7K. (W, 4-1).